Nothing rhymes with Orange. Not one word in the whole language. 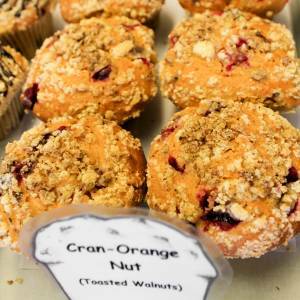 But that’s ok, because to make up for its phonic-isolation the bakers of the world (Frank Michaud being one of the finest) have soothed the lonely heart of the citrus fruit by pairing it with the cranberry in this wonderful muffin. Truly a union of great tastes this baked good is like the free-verse of muffins.